36(5)a (28-day reporting to tenant). A Gas safety Certificate, also commonly referred to as a Gas safety Record, is a document that confirms a Gas Safety check has been performed on gas appliances by a qualified Gas Safe registered engineer in the property you are letting. This document will confirm that gas appliances are safe to use. Which Gas Appliances should be checked? Gas appliance that the landlord supplies with the property MUST be safety checked. This includes appliances such as gas ovens, gas ovens, and hand held appliances that use gas. If the tenant brings their own gas appliance into the property, it is not the landlords responsibility to ensure they are gas safe. Yes, it is the law. How often do I need to renew my gas safety inspection? 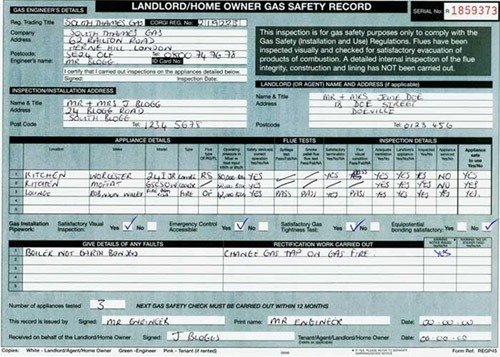 Gas Safety Certificate’s last for 12 months, so a safety check on all gas appliances need to be done annually. You do not need a new Gas Safety Certificate for each time new tenants move in. What do I do with the Gas Safety Certificate? Do I need a Certificate for each rental property I own?You should keep the original copy of the certificate for yourself. You must also give your tenant a copy of these gas safety records within 28 days of the checks being done, or give a copy of the gas safety record to a new tenant before they move in. Yes. You need a Gas Safety Certificate per rental property. So if you have a portfolio of 12 properties, you will need a separate Gas Safety Certificate’s for each property. A Gas Safe registered engineer can do the gas safety checks and provide you with a Gas Safety Certificate. Can my regular Gas man give me a certificate? Not necessarily. The gas man must be a Gas Safe registered engineer. Every gas engineer carries a Gas Safe Register ID card with their own unique licence number, showing the type of gas work they are qualified to do. Before any gas work is carried out, always make sure you ask to see their Gas Safe Register ID card. It can vary, depending on how many gas appliances need checking, and also location. What will happen if I don’t have a Gas Safety Certificate?